A warming workshop to ease us into the dancing year. The Raqs Sharqi style of Egyptian Dance works on integrating movement throughout the body. That is what gives it it’s charm, fluidity and ‘natural’ ease. Away with stiff isolations and contrivance! Instead there will be lots of practice on transitions and on calm, beautiful arm positioning both framing and free, and experiencing its integration from our finger tips to the soles of our feet. We will work also with the expressiveness of our feet and legs and feeling how this affects the clarity of our hip movements. That should keep the grey and cold at bay! I support students at their level, and because the emphasis is always on ease and authenticity, beginners will find the workshops an enjoyable introduction. Experienced dancers gain confidence and find new inspiration. This is the last workshop in the series of Pharaonic Baladi, the focus for the year. The theme gives remarkable insight into form and line, the Yang (male energy) quality which is so often missing in our dancing – not just in Baladi. The focus on the geometry of our arms and the juxta-positioning of shoulders and hips gives immense interest and strength. These charismatic qualities may well have evolved owing to the small amount of room available to dancers in the homes, cafes and courtyards of crowded cities where the fertile melding of Shaabi (music of the country) with other cultures and western influences produced Baladi (urban folk). Dancers had to give striking performances often in a very confined space. During the weekend we will be paying attention to integrating line and form into our fluid movements and the Taqsim (improvisational interlude) yet keeping the soft expressive spine – a wonderful balance of the Yin (female energy) and Yang principle. 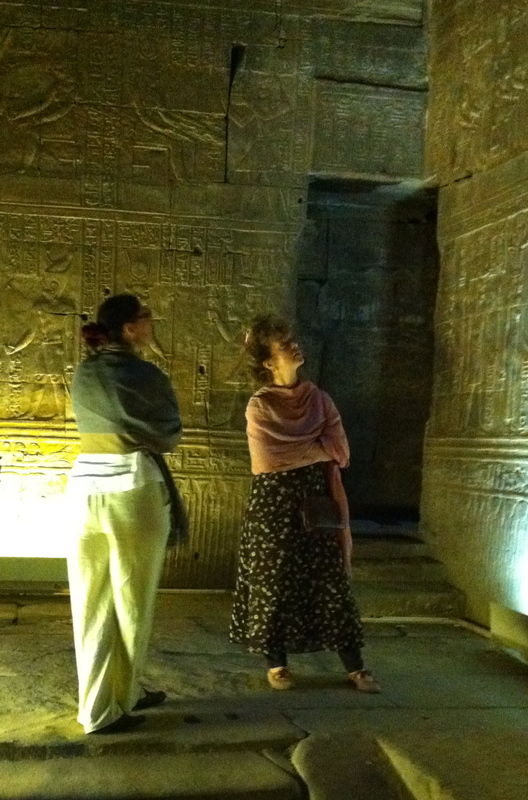 This picture of us gazing in fascination at the beauty of the temple images taken during our Dance & Culture Week in Luxor and Aswan reminds me of the impact the geometry of the figures had on me. That geometry, that strength of form is the inspiration for these Pharaonic Baladi workshops. In Gloucestershire in the second of these workshops, we will continue exploring this sophisticated but uncontrived form of Egyptian dance. Included in the workshop will be discussion on where the dancer would perform this style, what kind of costume would enhance the dance and we will contrast ‘Pharaonic’ with the less stylised Baladi with which we are familiar. In the teaching I support the student whatever their level, and because the emphasis is always on ease and authenticity, beginners will find the workshops an enjoyable introduction. Experienced dancers gain confidence and find new inspiration. Please book by sending a cheque to Liza Wedgwood – address provided on application. 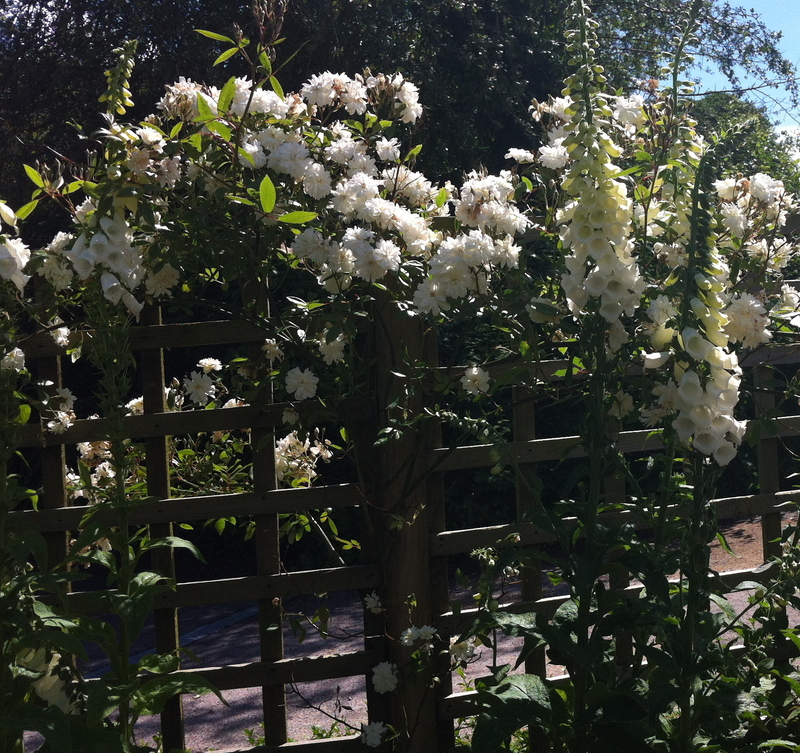 The sun has come out – briefly – and my eyes are caught by the display in my garden of the white upright dazzle of the foxgloves against the dainty tumble of the roses behind. As usual my thoughts drift towards the dance. This juxtaposition of form and flow is the harmony which we love about the natural world and is what we strive for in art. Raqs Sharqi is no different! I wrote previously that it was the beauty of the images in the temples and graves in Upper Egypt which gave me the impetus to look how we can use clarity of arm positioning to bring strength and charisma to our dancing. Arm shape of course is not enough. Unless the upper spine and the heart area is expressing the melody, subtlety, the effect of this arm positioning would be stiff and contrived. It is the softness of the the chest and the freedom of movement in the shoulder/arm joints which makes sense of Pharaonic Baladi. 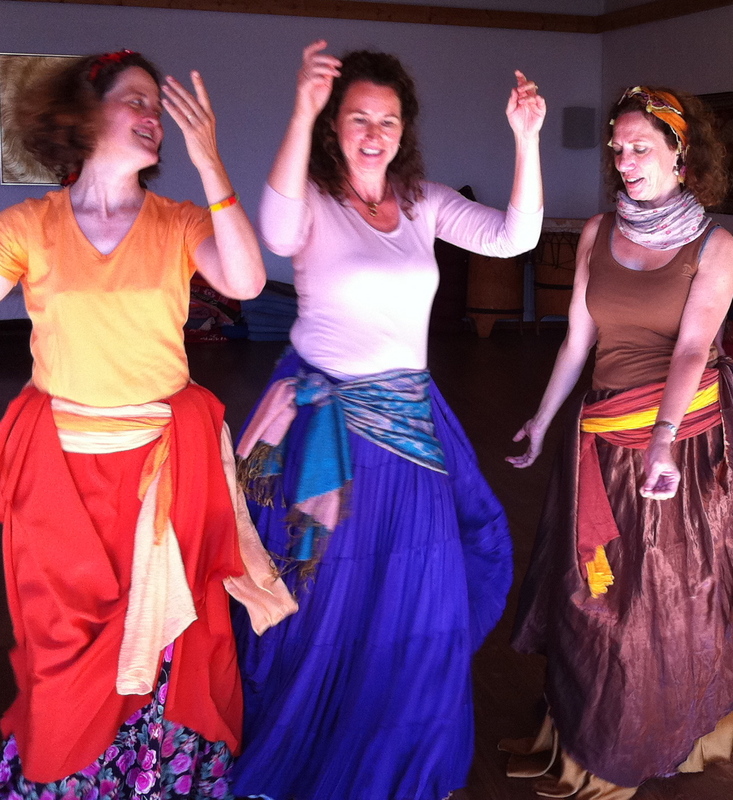 There are still places at the Pharaonic Baladi workshops next weekend. Please see below.